Up to 200 sf per room, stairs extra. Minimums and disposal fee apply. Not valid with other offers. Hot Carbonated Extraction Cleaning Method. Expires 05/09/19 Call Pacific Crest Chem-Dry at (360) 834-3319. Up to 200 sf per room, stairs extra. Minimums and disposal fee apply. Not valid with other offers. Hot Carbonated Extraction Cleaning Method. Expires 05/09/19. 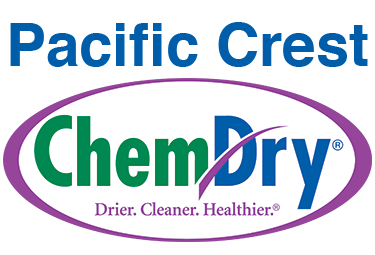 Call Pacific Crest Chem-Dry at (360) 834-3319. Granite countertops are beautiful centerpieces in the home. The durability of granite means you should be able to enjoy its beauty for years to come. Granite will, however, lose some of its luster and shine over time. Even if a sealant was applied when the countertop was installed, that sealant can wear thin and allow liquids to seep into the granite surface. Residue, germs, dirt and water spots can dramatically impact your granite surfaces. Regular maintenance, cleaning and sealing of granite countertops is critical to helping you protect your investment. There are many do-it-yourself products available, but these can often do more harm than good. Most contain harsh or abrasive ingredients that can damage the granite and make the finish appear dull. Pacific Crest Chem-Dry, your trusted professional carpet cleaner and provider of other in-home services that help you maintain a clean and healthy home, now offers a granite countertop renewal treatment that will allow you to fall in love with your granite countertops all over again. We recently commissioned an independent laboratory to study the effectiveness of our Granite Renewal Process in multiple homes. 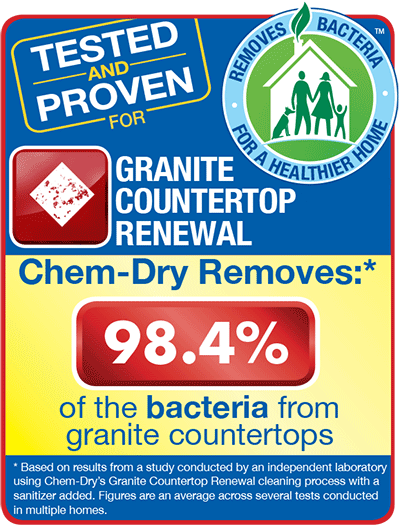 This study found that our Granite Countertop Renewal process, in conjunction with a sanitizer, removes an average of 98.4% of bacteria from granite countertops. Think of us when you want to refresh and revitalize your granite countertops for a cleaner surface, brighter shine and a healthier home. Our granite countertop renewal process penetrates deep inside granite’s porous surface, removing the bacteria that can spread germs and eliminating dirt and grime. We then seal the surface to keep those unwanted elements away, which helps restore the shine and extend the life of your granite countertops. 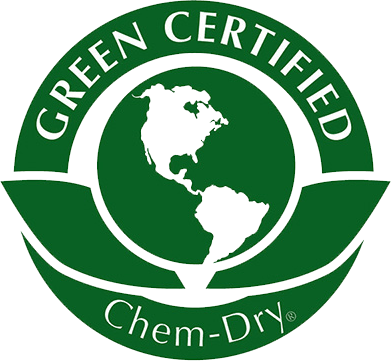 Our granite renewal technicians use green certified cleaning solutions that are safe and non-toxic and powerful deep-cleaning equipment to safely remove the dirt and build-up. Our proprietary Granite Countertop Cleaning Solution will remove built-up germs, dirt and grime from your countertops without abrasive scrubbing that can damage the surface. And because our solution is non-toxic, you can be sure your family is safe and your home will be cleaner and healthier when we’re done. Our final phase is the polish. We use our proprietary Granite Polish that will leave your countertops refreshed and revitalized, with a bright, beautiful shine that you’ll enjoy for months and years to come. Granite countertops are an investment and a beautiful accent to any home, whether it’s in the kitchen, bathroom, family room or even outdoors. While it’s important to keep it clean, that can be a challenge. That’s why it’s good to know you can use us to do the hard work for you – providing a deep granite cleaning and renewal and leaving you and your family with revitalized granite counters and a healthier home. Copyright © 2019 Pacific Crest Chem-Dry | Independently owned and operated.